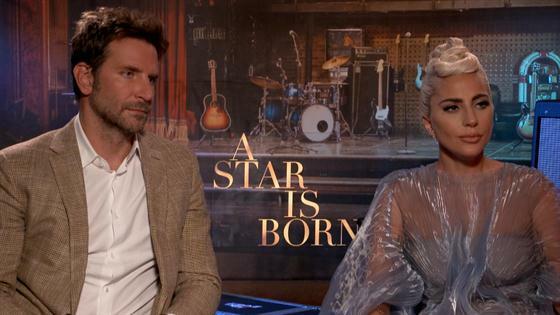 Lady Gaga's star burns brighter than ever in A Star Is Born, directed by her co-star, Bradley Cooper. The Warner Bros. musical, out Friday, is the third remake since Janet Gaynor and Fredric March originated the roles 81 years ago. Though details have changed—the O.G. stars certainly didn't perform at Coachella, for example—the heart of the story has stayed the same. It took seven years to get the latest iteration to the big screen. Director Clint Eastwood began developing the remake in 2011, with Beyoncé set to star. But the film stalled in development hell; at various points, Christian Bale, Tom Cruise, Leonardo DiCaprio and Will Smith were either attached or considered to play the male lead opposite the "Single Ladies" chart topper. After mulling it over, Cooper actually turned down the role, deciding he was too inexperienced at that stage in his life to play the down-and-out rock star. Around that time, Eastwood also expressed an in Esperanza Spalding taking over the lead role from Beyoncé. Eventually, the director bowed out of the film. Cooper took over in 2015, casting Gaga as his muse a year later. Taking William A. Wellman's direction, Gaynor's turn as Esther Blodgett/Vicki Lester led New York Times critic Frank S. Nugent to declare the film as "the most accurate mirror ever held before the glittering, tinseled, trivial, generous, cruel and ecstatic world that is Hollywood." For his role as Norman Maine, the popular actor received a Best Actor nomination at the Academy Awards. However, March ultimately lost to Captains Courageous star Spencer Tracy. Two years after she played the female lead in the Lux Radio Theater broadcast, Garland signed on to star in the theatrical remake. Upon its release, Time magazine's movie critic argued the beloved star "gives what is just about the greatest one-woman show in modern movie history." New York Times critic Bosley Crowther praised director George Cukor for shepherding his stars to give performances "that make the heart flutter and bleed." So, it should come as no surprise that Mason and Garland both got Oscar nods for Best Actor and Best Actress in a Leading Role. The actress' performance as Esther Hoffman Howard helped make director Frank Pierson's musical the third highest-grossing film of the year. Streisand won a Golden Globe for her acting work, and she and Paul Williams won the Academy Award for Best Original Song ("Evergreen"). As rock star John Norman Howard, the actor displayed "a nice, unaffected looseness" and was "convincing in his concert scenes," according to film critic Roger Ebert. Perhaps that explains why he was awarded the Golden Globe for Best Actor in a Motion Picture (Musical or Comedy). The pop star got a major makeunder to play Ally. Entertainment Weekly's Leah Greenblatt praised the artist for "her restrained, human-scale performance as a singer whose real-girl vulnerability feels miles away from the glittery meat-dress delirium of her own stage persona." In addition to directing the movie, Cooper learned to play guitar and took vocal lessons to become rock star Jackson Maine. In his review, Variety's Owen Gleiberman lauded the multitalented star, saying Cooper made a "a transcendent Hollywood movie" for Warner Bros.